After we reviewed shortly about Adobe Brackets three years ago, today we have a huge list of Adobe Bracket extensions. 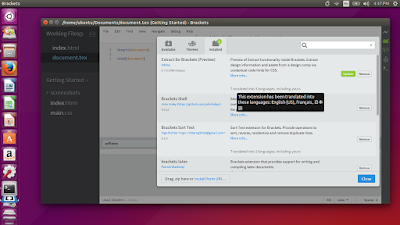 We will explain how to install extension in Brackets in Ubuntu. I will show you both online and offline methods. 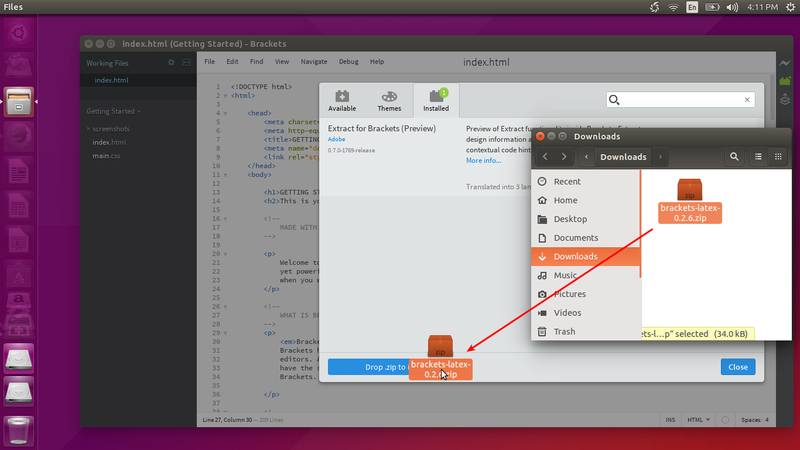 I use Brackets 1.3 and Ubuntu 15.04. 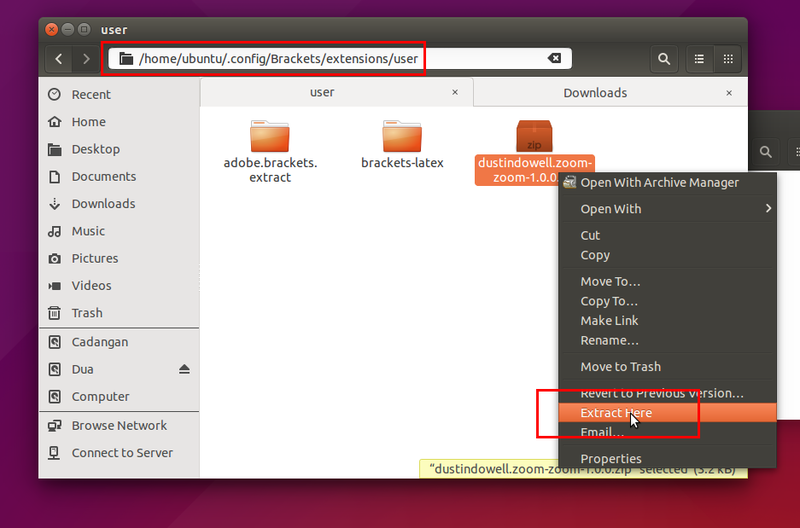 You can use this guide on another Ubuntu version. You will need internet connection to do these. Open Extension Manager via block icon on Brackets top-right corner. See picture above number 1. Open Available tab. See picture above number 2. Find extension you want. For example, you want Brackets Beautify. Click install button. Wait until finish. Open your file manager (e.g. Nautilus). Drag the ZIP file of extension into the Drag .zip here label. Sometimes, you will need an alternative way. To install an extension directly into its directory, extract the ZIP file into /home/<yourname>/.config/Brackets/extensions/user directory. Then restart Brackets. See picture above. 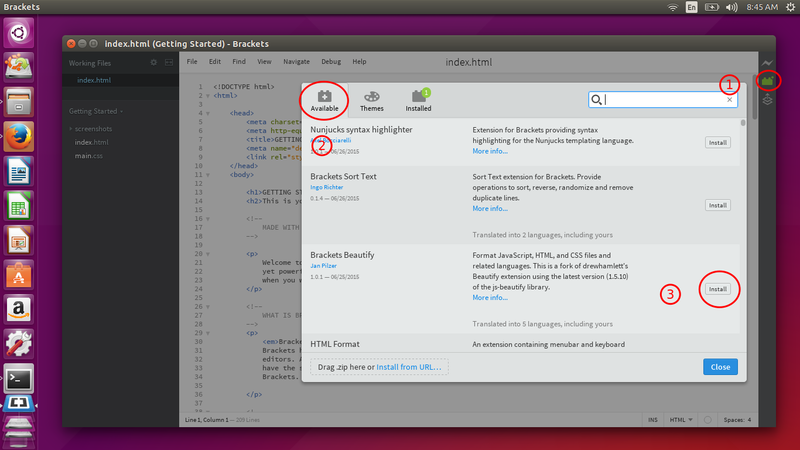 If you want to download Adobe Brackets extension and save it yourself, go to https://brackets-registry.aboutweb.com. It is Brackets official extension repository. Weekly Extensions Chart (http://ingorichter.github.io/BracketsExtensionTweetBot) - It tells what 11 top extensions weekly. Create Extensions (https://github.com/adobe/brackets/wiki/How-to-write-extensions) - It is an official wiki that tell you anything basic with how to create a Brackets extension. Extensions Recommendation (http://www.johnpapa.net/my-recommended-brackets-extensions/) - It is an example of selected extensions by John Papa. You will have yours, but an example is always helpful. Adobe Extract (https://helpx.adobe.com/creative-cloud/help/extract-for-brackets.html) - It is an official guide to use Extract feature in Brackets. Extract is an Adobe technology to help users design the web with Photoshop PSD easier.